It’s a beast this week! The incredibly fast glide of Mr. Colin Bishop was on display at the Ravenstonedale 10k. In a strong field Colin came 6th in a time of 36:28. The course featured several hills around a beautiful village. One worth doing according to Colin; that word is law so look out for this one next year road runners! To start the report, I would beg your indulgence and allow me to paraphrase Darwin’s theory of evolution part 1 (the original) – a load of slow moving creatures moved out of their swamps onto the land, moved over continents into new lands, developed new skills and become a super species- the human. 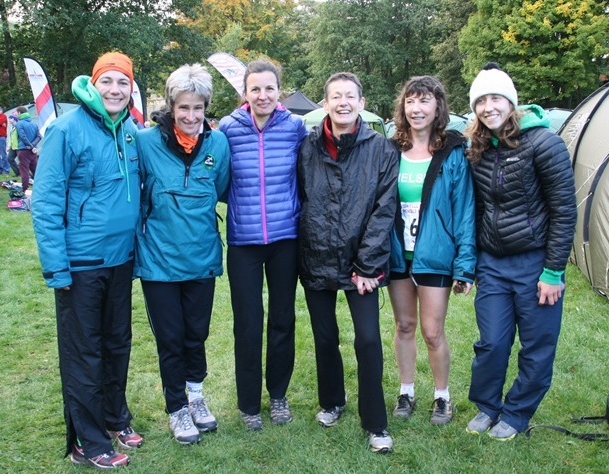 Darwen’s theory of evolution part 2 relates to the evolution of the next level of super species – Helsby Running club’s ladies in the form of Jackie and Jane. 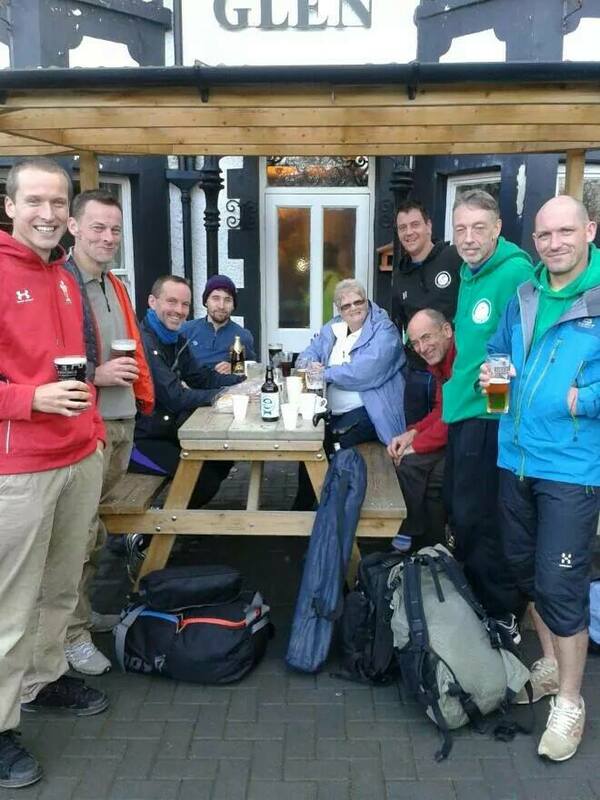 How can they drink the amount they did on Saturday evening, retire to their swamps, emerge on Sunday morning, move over continents (Cheshire to Darwen, Lancashire), learn how to walk / run again and then deliver fantastic results, it is beyond belief. A super species if ever there was one. Now onto the detail of the race, a short sharp route up from Sunnyhurst woods to the Darwen tower, across the moors, traverse back across the other side of the hill, climb slightly back towards the tower and then let go on the 1 mile descent back to the bandstand in the woods – a kind of fell running equivalent of a 5K – all runnable and nowhere to hide. A quick note on Saturdays Liverpool & District XC. A top class event and amazing to see all the top runners with a huge number of U23 in the field. Results are on local Liverpool & District site and UKA site. In the end I arrived late and ended up doing the men’s open race instead (I was runner 1294 in the mens race, no name assigned in results yet! ), a good thing really as it meant the “men” has a team of 6 in the race! Just short of 6 miles in 3 big laps of Sefton Park. A great atmosphere with a large vocal crowd and race commentary that could be heard throughout the race. My second and third laps were an incredible contrast but both enjoyable and memorable! I got lapped towards the end of my second lap, but it was an amazing seeing top speed athletes fly past all pushing each other and the finish line with very lively commentary. The third lap saw a hardy bunch of also rans continue around the park, in quiet solitude, an amazing contrast that sums up the full spectrum of running! As the race was won by 2 Scots, whilst steadily running through the beech tree walk at the far side of the park, Flower of Scotland and the Gay Gordons followed by Bay City Rollers and the Beatles echoed out, I’ll remember that for a while! 6 Helsby runners arrived at Sefton Park all in awe of the talent on show for this 9.8km XC, it was a qualifying race for British Athletics cross country team that travels to Bulgaria in 2 weeks time for the world XC championships, Mo Farah and Andy Vernon have ran this over the past few years and Gemma Steel was taking part in the womens race again which she won last year, and yes she won again this year. Not quite sure how the results have worked out but there was nearly 600 runners but think the elites have been stripped out of these below? 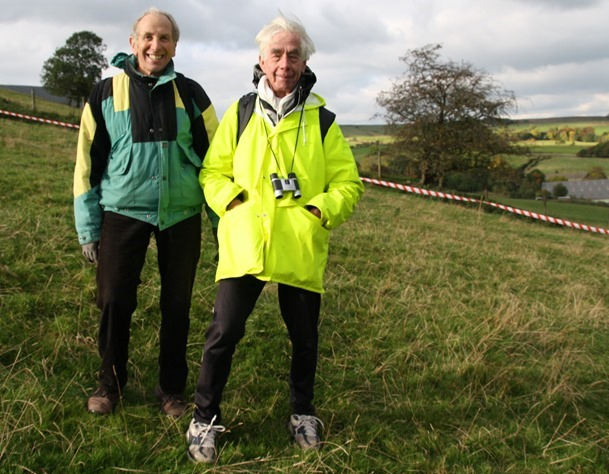 Former Chairman Andy Smith provides an account of Sunday’s XC action. A fine, still, sunny autumnal morning made for perfect running conditions for the second cross country race of the weekend. Going firm to soft. I’ve raced at Arrowe Park loads of times over the years and still have a fondness for it as a cross country course, it isn’t the most technically challenging course, but has enough variety in it to keep it interesting. This year for the first time it the course was run in an anticlockwise as opposed to the more normal clockwise direction which made some differences. Leaving the narrow path through the tussocky grass until later in the lap removed this bottleneck, but the tight turns round the infield straight after the start still made for some jostling for position before the gentle climb to behind the hospital could shake the field out into some sort of order. With 8 green vests lining up to the start line we had some impressive running from the Green Army; Gaz pulling on his spikes for the first time since he was 14; Colin B fresh from a tough 10 k in the Lake District; Colin T fresh from his new found interest in nordic skiing; Adrian looking fresh from his good run in Sefton Park – myself feeling less fresh from the previous day; and Ian Landucci, Lesley and Vanessa just looking fresh as daisies as always. Thanks to Jane for support on the course and an impressive array of cakes for afterwards – more than we could eat, despite our best efforts. Yet to see the results, but I think the combined men’s team were 2nd on the day against some very strong competition on the day. Well done to all the Helsby team. 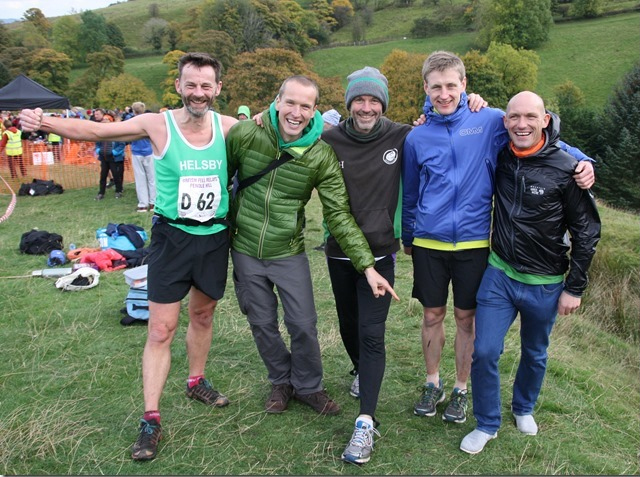 Ok, so not a long distance trail or an ultra, but it doesn’t fit anywhere else so here is Andy Robinson’s report from the weekend. I ran in the Dark & White mini Mountain Marathon in the Peak District yesterday: 4 hours of navigation in thick cloud From Edale & around Kinder Scout. I came in 48th out of 162 finishing teams (teams of 1 or 2 runners), 9th V50 out of 35 teams. Results are here. It was a great event, with everyone’s navigation skills given a full workout. 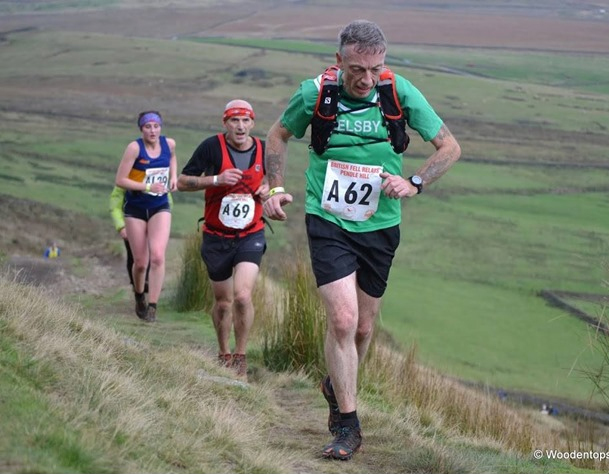 After the race we had the AGM and prizegiving for this year’s Runfurther Ultra Championships – I won the V60 category for 2014, full details here. I won a £25 voucher and some running socks. I’ve spent the voucher on more socks – can’t have too many socks. Then I got bladdered with the rest of the committee. I’ll talk about the Runfurther series as part of my talk on Wed 7 January. Fantastic result Andy, huge congratulations!!! 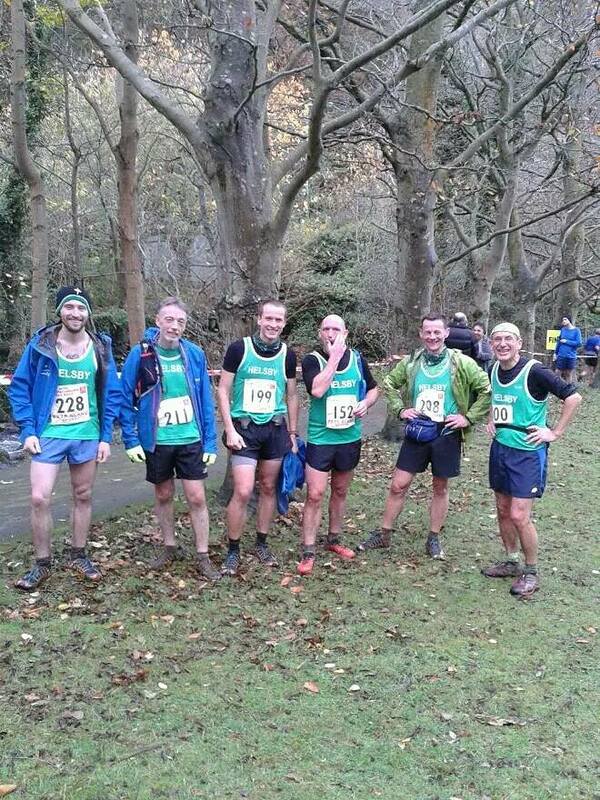 I also ran in this race from Totley, near Sheffield, the weather was better & I wasn’t. I could only manage 69th out of 100. 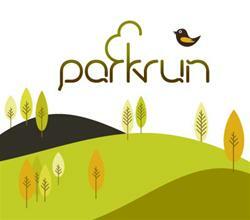 I took advantage of a weekend with friends in London to run Bushy parkrun near Hampton Court – the ‘home’ of parkrun. It attracts much bigger numbers than our local runs, but the route is open enough to accommodate everyone easily. 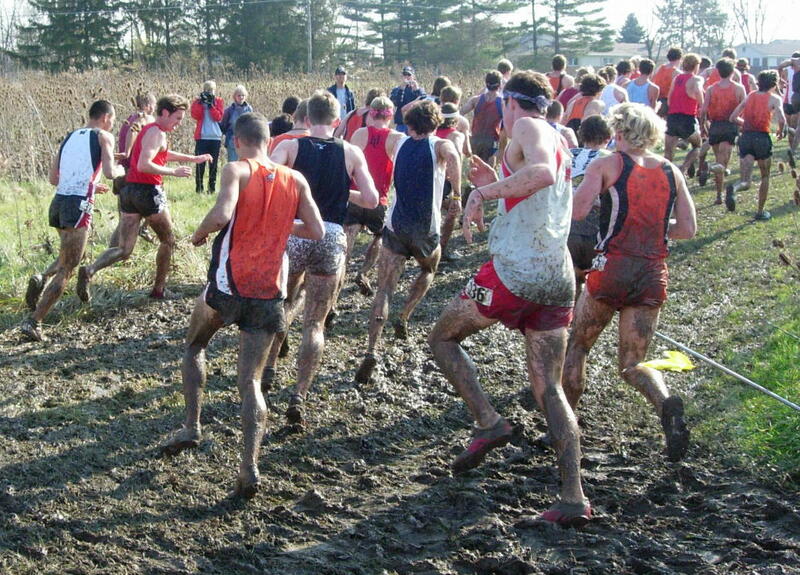 The surface was a mix of grass and compacted mud, with very little of the run on tarmac. The most impressive thing is the way that the volunteers deal with almost 1000 runners, especially in the finish area. 23:31 got me 266th out of 964 finishers. Looking at the winning time I suspect they are a pro in disguise! Speaking of Pros, Colin Thompson showed his calss to take first in the Warrington Park run – Top work Colin! 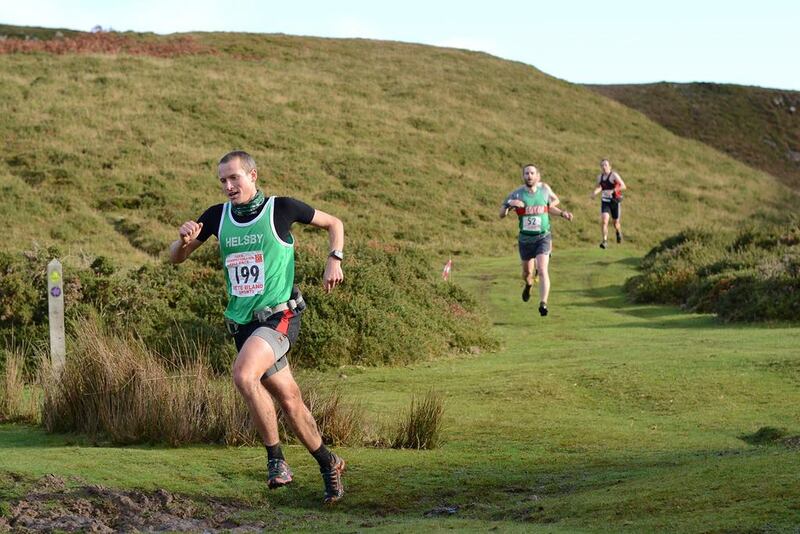 Details: 9m, 800m, a tough but rewarding one around the Shrophsire Hills of the Long Mynd. We’re currently short of Marshals. The 4VHM is critical to club funds, is why your membership is so cheap and it is the blue ribbon event for the club. Please contact Dave Feakes if you can help out. Runners please remember it’s unusual for runners to run in their own club’s race, certainly when it is on this scale. Please could you provide a volunteer to help out with the marshalling (friend, family member, etc.) They get a good spectator spot guaranteed! Don’t worry if you’ve not marshalled before, we will let you have full details of the role prior to the event together with a very attractive marshal’s vest. Sandstone Trail Challenge open for entries! Naturally Andy will also be looking for volunteers so if you don’t fancy running it but can help out then the date for your diary is Sat 9th May 2015. Please let Andy know if you can help. Helsby Parish Council would like to develop the land where Sherwood Court once stood(by the Library), as a outdoor adult exercise park. They need to do feasibility study, so they are applying for a grant from Active Cheshire to enable them to take this project forward. So please vote and hopefully we can improve this run down area of the village. Jackie, Betty and Colin, were also out on Saturday promoting Helsby Running Club at the open-morning event supporting the local GP Health Centre PPG initiative called ‘Keeping Well In the Community’ or ‘KWIC’ at Helsby Community Centre. No, We’ve not idea what Dave is doing either, but it makes for a good photo! Helsby Night out was…well a typical Helsby night out, lots of laughter, lots of drunk people, and lots of great xmas jumpers on show, thanks to everyone who came and had a right old knees up, I hear people are now joining Helsby RC just to be able to come out with us, never mind running. Starting off with a bang this week is a series win for Tim Palmer on the 10km Lakeland trails series; simply fantastic. The Palmer household was not happy just to leave it there though, as Jenny scooped a fantastic 6th place in the vet Ladies and 9th lady overall. Congratulations and very well done indeed! Park run continues to spread – making the results capture harder, but introducing more courses to play with on a Saturday morning. Great to se so many Helsby vests at these events. Notable mentions this week go to Ellen Harris – making her debut for Helsby in a superb 24:40, Donna Geer and Carl Pratt both bagging PBs and the ever superb Colin Bishop for taking home the win in St. Helens. Well done all! Celebrating its 40th running, the fell race at Penmaenmawr has a strong following. There were plenty of Helsby vests on display despite the mass panic when we all realised that there was no entry on the day (in fell running it is highly unusual that you can sign up in advance let alone that you actually have to). That was the only unusual thing about this race though as like every other fell race it had fantastically tough but rewarding hills, incredible scenery, varied conditions under foot, beer at the end and fantastic value for money (£10 covered race entry, a lovely ceramic mug, a bottle of real ale, a hot dog and soup and a roll). The race started off with a rude awakening racing up on to the top, but gradually flattened out as the race stretch out with glorious views across to the Carneddau on one side which took my breath away… ok, so the hill had helped.. and on the other side views out across the sea to Anglesey. The race then crosses some slightly rough ground and bog before returning around over some undulating, but mainly flat ground before the final steep single track descent. Max gave a hint of what he is capable of by holding 5th position ahead of Jez Brown until the downhill section undid him. A stunning 9th place overall and 3rd in his category, matched only by Andy Robinson who came in 3rd for his age category too. Phil Gillard and Jim Jones battled it out, but Phil’s rich vein of form saw him through with less than a minute separating them in the end. Steve Riley celebrated his 50th birthday too according to the age categories on the results – you must have a good moisturiser Steve. Great running from everyone on what is probably a tougher course than last year, sadly Jane had to pull out with an injury, so all the best with the recovery. Just to point out the progress of two of our runners here managing to deliver a PB despite the bumps in the way. 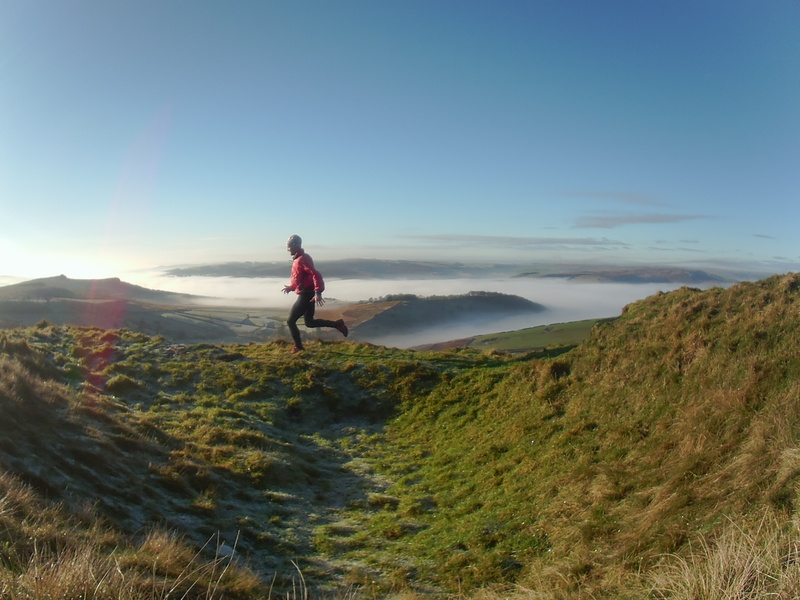 After a spot of fell running this year Laura confessed that she got to over the first hill and thought, what are they all moaning about, this isn’t a hill… she wasn’t thinking that on the final hill mind! Still Laura managed a fantastic PB and agonisingly close to that sub 1:40 which is bound to come soon. Another fantastic performance from Louise prompting Ste Wiggins to call for a drugs test such has been her fantastic form lately. Well done to all. Sun 30th Nov Cross Country Counter No 4, North West Sunday League, Arrowe Park, 10 am, meet at club at 8:45am if you wish to travel together. I’m guest in the chair for the weekly roundup and there is a lot to get through so hold tight! Firstly I’d like to highlight Colin Thompson who was invited to slip into a Cheshire vest this week – fantastic achievement Colin well done (glad to see you’re taking your captaincy seriously and leading from the front). Secondly, if I have missed anybody/ anything off please let me know and I will update the blog. 14 Jim JONES 20:57 VM45-49 69.85 % M 14 Helsby RC First Timer! It also saw a welcome return of ‘friend of the club’ Jeff McQueen to take second place. Great running both of you! Hellrunner is 12 miles of or errrr Hell. It’s a run through Delamere which see’s you run all on trails, take on The Hills of Hell, Lucifers Lake, and the Bog of Doom, but for me it’s my favourite race of the year as it’s totally different to the runs I normally do, and the atmosphere is brilliant amongst 1800 plus competitors. I would really like to see more of the Helsby posse down there next year. A wrong turn and a twisted ankle cost me dearly but never too bothered as it puts a real big smile on my face just finishing this one, and Saturday seen myself and Jim cross the line together, after running separately for nearly all of the race, cannot wait for next year which will be my 7th! 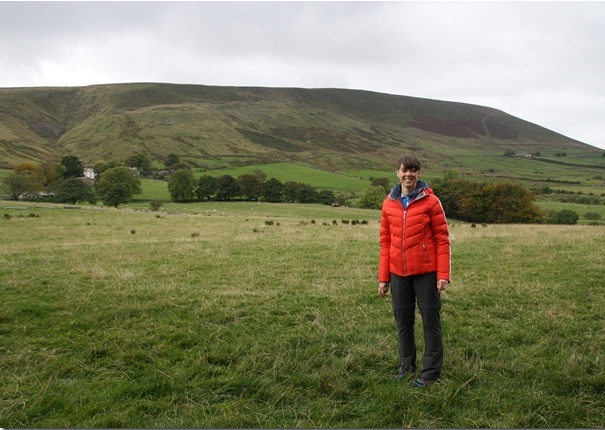 I ran the Kilburn Kanter on 1st November, a 24 mile/3600 foot ascent tour around the Hambleton Hills in the North York Moors national park. 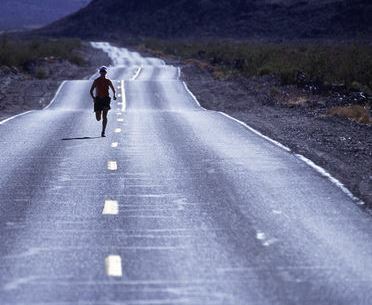 It starts deceptively gently apart from one long early climb, and most of the hard work comes in the second half. The biggest climb is up to the top of Sutton Bank, and is only a couple of miles from the end. The weather was fantastic, though the ground was still pretty boggy in many places. The views were stunning, and as with all LDWA events, the checkpoints were incredibly well stocked with goodies. The whole event was really well organised and friendly. I recorded 5h 46 m, which was a nice surprise as my Garmin had died on the way round and I thought I had run longer. Fantastic work Ben, a difficult part of the world to run in, but clearly rewarding! It was a fantastic morning for running and great see so many PBs achieved on the Arley Hall route, Jo Lacking finished first for the ladies and was 13th female overall, with a PB of 42.09. Jenny O’Hare and Shan McCarthy finished just one second apart with PBs of 53.18 and 53.19 respectively. Donna Geer then finished in 55.10 a whopping 2 minute PB! The PBs didn’t stop there as Alison Butler came in 55.50, Tanya Meredith followed in 55.56 and Emma Barnes, who was still struggling with a knee injury kept the PBs flowing in 58.05. Jane’s training is obviously working wonders and it fantastic to see these results, especially as several of the runners haven’t been running that long. I hope we get similar results next Sunday at the first Borders League Race at Christleton! For the men, Roy was first back for Helsby in 41:08 and our resident ghost runner (Dave Madders) also ran and delivered a PB of 41.46. He doesn’t appear on the results as he was running with someone else’s number. Tsk, tsk. Thanks Carol, although you did miss out one other runner on the day, a certain Carol Shaw who came in a stunning 4th in her category in 44:26. Fab running from all concerned! 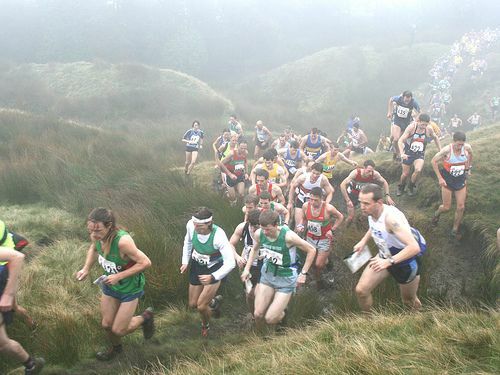 The race was a representative match between Cheshire, North Wales and Staffordshire, each team consisting of 10 runners, 6 men and 4 ladies with the team scoring the most points winning the trophy. I arrived an hour before the start time and met up with Adrian Thiemicke (Cheshire team manager) and he handed me a Cheshire vest and showed me the portakabin for baggage storage. I then met the other Cheshire runners, lined up for some photos, quick warm up and before I knew it I was on the start line. The course, I’d been told, was a very undulating 5 mile route, starting from the bottom of St Georges Road, looping around the surrounding back roads and finishing in a field adjacent to the A55. The standard of runners was very high, as well being a county race it also incorporated the North Wales road champs. My strategy was to start off tentatively and gradually build throughout the race, hilly courses aren’t my strength so I knew if I went off too quick I’d blow up too soon. The strategy seemed to work well and I felt good after the first mile so I picked up the pace and it wasn’t long before I caught the leading lady and we battled it out for most of the race, only towards the finish I managed to pull a small gap and crossed the finish line in 28.41, 3rd Cheshire runner home and 3rd in my age group – 15th overall! Both the ladies and the mens course records were smashed on the day, with various other age group records being set. All of the other Cheshire runners seemed to have a good race, 1 in the top 3, another top 10, a couple of other age cat trophies won too. Unfortunately we didn’t win the match, losing out to North Wales, but it didn’t seem to dampen anybody’s spirits, big smiles all round at the award ceremony. It was a brilliant day and one I won’t forget. I felt very honoured to have been selected for the county, something that was a distant dream when I coughed and spluttered around my first 10k race a few years ago. Thank you to Louise for her support on the day and also my parents who made the journey over, they’ve both never been to watch me race before so it made the day that little bit more special. Seriously fantastic running Colin – not the last time you’ll be pulling on the Cheshire vest I suspect! Now for the grand finale! The Fell running (can anybody tell the editor’s bias?). 11 Helsby vests clearly in agreement that such a splendid day should be marked with a tough 15km and 3000ft beast of a race. 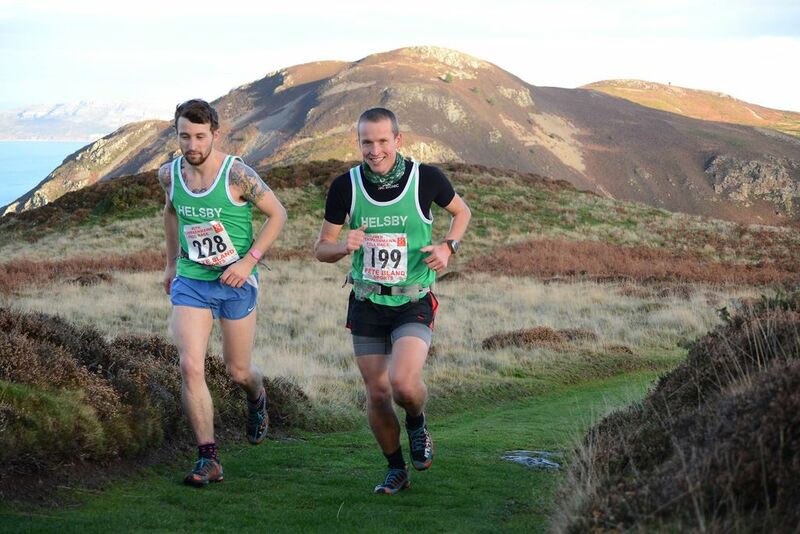 A combination of factors had put this race onto the list of Fell club counters for a second year running – the proximity being down the list behind a fantastic course and the smallest of margins that had separated the first three Helsby vests in 2013. With Helsby newcomer and Max “hill eater” Wainwright squaring up to the heavy weight Jimmy “the machine” O’Hara would it be achingly close again? Finally underway the lack of knowledge of the route from the front runners showed as they missed a turning up the first hill. Some interesting lines were taken on the first descent of the day (I for one deciding to go down the middle of the two lines and finding the worst possible outcome). The wind threatened to make life difficult as we approached Offa’s dyke and turned towards Moel Arthur, but it generously died down for the duration of the race. A thrilling descent was followed by an exhaustingly runnable climb that seemed to never end. The summit of Moel Famau within touching distance the route then took a perilously steep and heather covered descent before the leg destroying climb up the gully to the summit. Helsby’s cheering squad led by my boys but fully backed up by Laura and Helen Gillard greated us at the top before the final descent back to Clicain. A tough but thoroughly rewarding route with stunning views right the way over North Wales. What about the race I hear you cry! Well, at the crest of the first hill the race was decided as Max badly rolled his ankle – even still it would have taken a monumental effort and performance to have taken on Jimmy who stormed home in 5th place overall. Jimmy knocked something like 8 minutes of his time from the previous year and showed what a classy season he is having. Fantastic work Jim and well deserved! Full results are below showing great performances across the board. For those of you that haven’t tried the fell running I can’t recommend it highly enough – give yourself a challenge and embrace the mud. I can guarantee you won’t be last and will have a great time. All this for a bargain, as Paul Foster put it: ‘… tea,soup,bread and a mince pie at the end all for £6’ couldn’t have said it better myself! Fancy giving it a go? Then why not join in the Dave Staffs Memorial race Sunday 30th Nov – Just over 5 miles and 1200 ft. These are FREE and we’ve been close to promotion so every runner toeing the line is important. They are great fun and highly recommended. Friday 7th at the Club there will be the annual Helsby fireworks display. Entry is a bargain at just £3 for adults and £2 for children. There will be fairground rides and refreshments available and Chris Fitzpatrick will be there, but don’t let that put you off! Fireworks start at 7:30 pm.